» Bronte’s $274 ewes top Hay sale. Woodpark Merino and Poll Merino Home / News / Bronte’s $274 ewes top Hay sale. 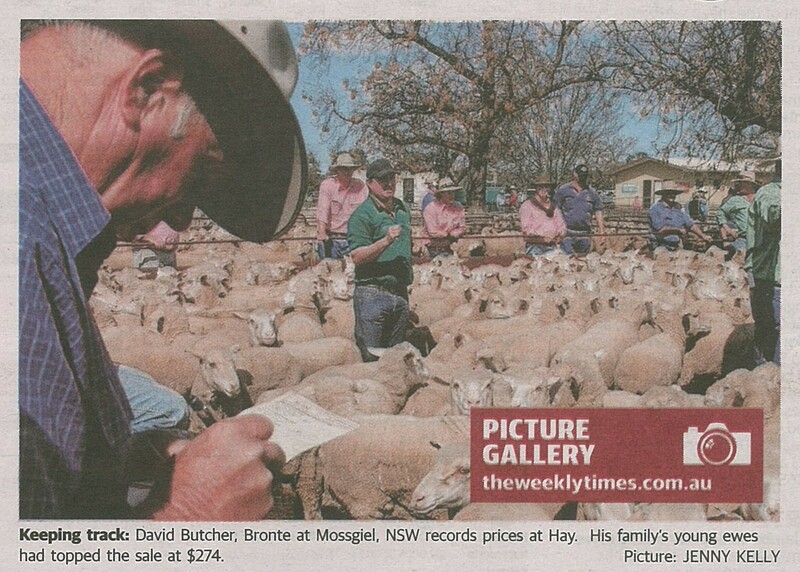 Bronte’s $274 ewes top Hay sale. David and Barbara Butcher’s careful management paid off when their 900 May/June 2015 drop Woodpark Poll blood ewes topped at $274/head at the Hay September sheep sale. 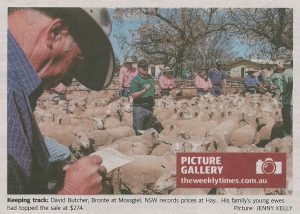 The Butcher’s “Bronte”, Mossgiel bred ewes were joined in the price stakes when the operation’s four year old ewes topping the older ewe portion of the 30,000 head yarding, at $183/head. “There was a trend of buyers dropping back on to some of the prove breeders to save money and also access better lambing percentage. It resulted in the four-year-old Bronte Merino ewes making up to $183/head.” – Jenny Kelly, The Weekly Times, 28/09/2016. Image: courtesy The Land. Barbara and David Butcher, “Bronte”, Mossgiel, with their $274 a head young ewes sold at the Hay sheep sale last week. Photo by Murray Arnel. About 30,000 sheep were yarded on a perfect Riverina spring day for the Hay Annual September Sheep Sale last Friday. Elders Hay branch manager Bill Haygarth said supply was back a bit due to wet conditions restricted stock movement, but interest in station-bred Merino ewes continues to be strong. “Sheep presentation throughout the entire yarding was exceptional with the current season highlighting the superior genetics of the Riverina,” Mr Haygarth said. Prices for the autumn/winter drop Merino ewes ranged from a top of $274 to $158, with 2014 drop ewes selling $175 to $161, 2013 drop ewes sold to $180, 2012 drop ewes $156 to $182 and 2011 drop ewes sold from $183 to $130. About 5000 Merino wether weaners were yarded and sold from $91 to $112. The most successful vendor of the day was David and Barbara Butcher, “Bronte”, Mossgiel, who achieved the highest price of $274 for the tops of their 900 May/June 2015 drop, Woodpark Poll-blood, August shorn, ewes. Other successful vendors included Yarto Pastoral Company, “Yarto”, Booligal, who sold the top line of their offering of 1000 March/April 2015 drop ewes, Alma-blood and August shorn for $262, with the second pen selling for $216, and GM and HM Morphett, “Yamba”, Booligal, received $226 for their offering of 500 April/May 2015 drop, Alma blood and August-shorn ewes. The McKindlay family, “Mooloomoon”, Moulamein, yarded 1200 June/July 2015 ewes, Goolgumbla-blood and August-shorn, selling them for $265, while Caroonboon Pty Ltd, “Caroonboon”, Boorooban, sold 300 June/July 2015 drop Caroonboon-blood ewes, April shorn for $272. Among good sales in older ewes, the McKindlay family, “Mooloomoon”, Moulamein, received $181 for their draft of 1000n June/July 2011 drop, March-shorn Goolgumbla-blood ewes, and PM and GM Lawrence, “Formosa”, Hay, sold the tops of their 1600 May/June 2011 drop, Charinga-blood and August-shorn for $147, with the second line selling for $131. Wether weaners attracted keen competition, with A and R Hiscock, “Waiko”, Ivanhoe, receiving $112 for the tops of their draft of unshorn 1500 May/June 2016 drop, Alma-blood and $105 for the second line, while Brett Schiller, “Tarwong”, Hay, sold the tops of his unshorn 1200 May/June 2016 drop, Bluebush-blood wethers for $105. Hay Associated Agents, Elders and Landmark conducted the sale.